Eminent Technology LFT-8b loudspeaker from Eminent Technology, Inc.
Hi-Fi Speakers > Eminent Technology LFT-8b > Eminent Technology, Inc. The Eminent Technology LFT-8b is a hybrid, with push-pull, dynamic planar loudspeaker elements for the midrange and tweeter and a conventional cone loudspeaker for bass. 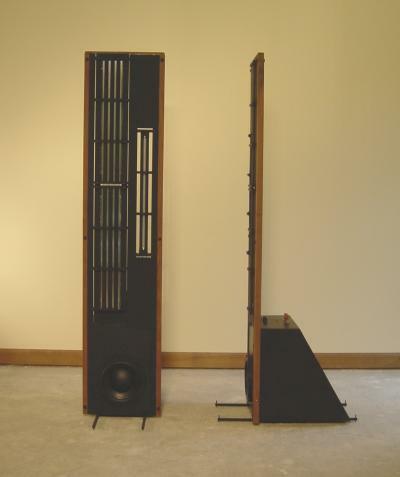 The planar section is in a sense, the magnetic equivalent of a push-pull electrostatic loudspeaker, differing in that it requires no step-up transformer or bias voltage, and that the audio signal is applied directly to its diaphragm. The U.S. retail price is $1899 per pair. Eminent Technology LFT-8b > Eminent Technology, Inc.